37 Stepney Green was built for Dormer Sheppherd, a slave owner and merchant. In 1714, Mary Gayer, the widow of the East India Company’s Governor of Bombay, Sir John Gayer, moved in and it is her initials, ‘MG’, that are visible on the gates. 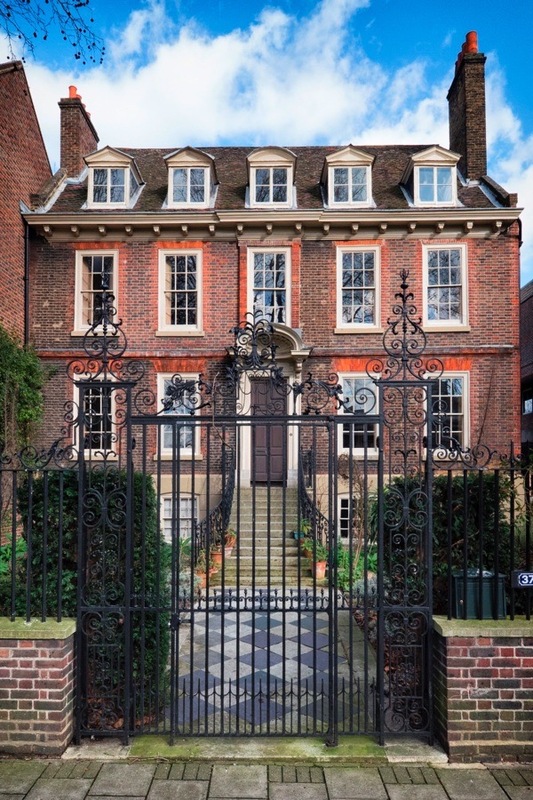 Such houses are a reminder of when this was ‘Millionaire’s Row’ – their wealth derived from mercantile trade on the Thames. Later residents included a Chairman of the East India Company and Nicholas Charrington, a member of the brewing family. From 1875 until 1907, the house became a Jewish retirement home. Thereafter, it was briefly a Craft School before passing into the hands of the local authority in 1916. In 1998, Spitalfields Historic Housing Trust took ownership and it was fully restored by the new private owner. 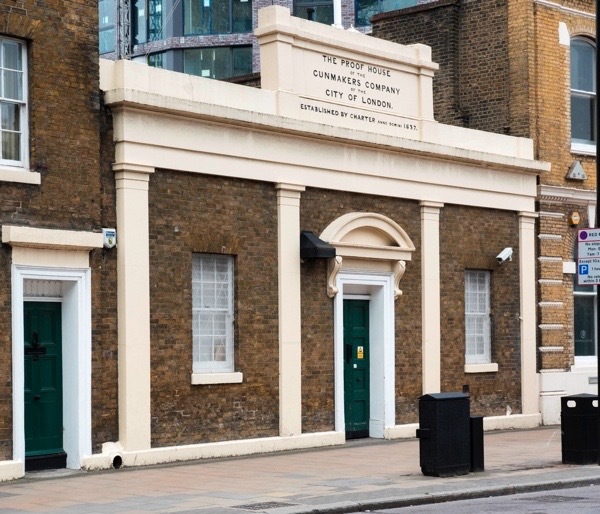 In a quiet street behind the Royal London Hospital is one of Whitechapel’s most unusual buildings. Surrounded by eighteenth and nineteenth century buildings, the modernist Gwynne House appears like a landlocked ocean liner. Designed by Hume Victor Kerr, it consists of twenty-one flats over five storeys, linked by a rounded external staircase on which the name is displayed in art deco lettering. The design has an undeniable nautical flavour, with rounded windows in the front doors like portholes and the original white finish of the building survives. Originally owned by the Royal London Hospital, it was built for as accommodation doctors and nurses but, in 2012, the owners decided to sell it to developers, citing that medical staff no longer expect or want to live in hospital-owned accommodation. Unusually for an architect, Kerr also had a prolific military career. After lying about his age to fight in the First World War, he went from private to major between 1914 and 1919 and from gunner to colonel between 1939 and 1942. Between and after the wars, he was a prolific architect. Also in Turner St is a factory he designed for M. Levy and in New Rd is his imposing Empire House, a warehouse and showroom, sold for redevelopment in 2015. Over in Middlesex St, he built Commerce House, which was demolished in the nineties, but the surviving buildings in Whitechapel ensure Hume has left his mark on the area. 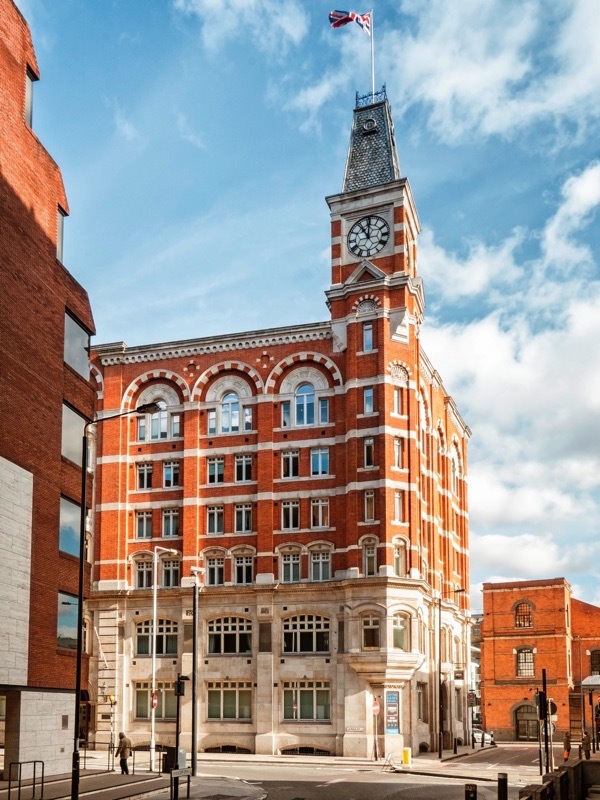 The impressive red-brick building on the corner of Leman St & Hooper St, complete with an imposing clock tower, was built for the CWS as its London headquarters. The name is still visible on the recessed brick, alongside the wheat sheaf motif and the ‘Labor and Wait’, motto – with the American spelling to show support for the anti-slavery campaign. By 1900, Leman St became lined with warehouses for sugar and tea and coffee roasting and the CWS became known as the ‘Larder of Leman St.’ With its proximity to the docks, the CWS operated speedy transport links to its national headquarters in Manchester. The London headquarters remained in use until the late sixties, when nearby St Katharine and London Docks closed and the need for storage and offices declined. The beautiful ceilings, inlaid woodwork and fireplaces of the original CWS London headquarters are no longer to be seen as the building was converted into luxury apartments in 20o9. Yet the clock tower remains, said to be a replica of Big Ben, though a quarter of the size. The makers, Thwaites & Read, restored it to working order with a digital mechanism, though it no longer chimes, which is obviously an advantage for residents. At the top of Leman St, a gleaming white Italianate building built in 1858 proclaims itself proudly as the ‘Eastern Dispensary’ with ‘Supported by Voluntary Contributions’ on either side of its ornate porch. Prior to the National Health Service, public dispensaries provided medicines free of charge and provident dispensaries were run on a self-help basis via subscription. Founded in 1782 by doctors in the City, the Eastern Dispensary was originally located on Great Alie St. In 1858, it moved into this building designed by G. H Simmonds, a local surveyor and secretary to the dispensary. Remaining as a dispensary until the Second World War, afterwards it was leased to various charities before falling into disuse. To protect it from redevelopment, the dispensary was listed by English Heritage and sold only when the new owner would ensure refurbishment. In 1998, it was restored and reopened as a pub with a mezzanine gallery overlooking the former consulting room. This small, unassuming yellow brick building belonging to the Worshipful Company of Gunmakers has few distinguishing marks and is easily missed by the traffic hurtling down Commercial Rd. Granted its royal charter in 1637 to promote and regulate gun making, the Company has continued this work to the present day. All guns sold must be tested to confirm soundness of barrel and action. Originally sited alongside the Aldgate, in 1675 the Proof House moved to a less-populated area just outside the City following an explosion that damaged the City wall. The current London Proof House dates from 1757 and the Livery Hall alongside from 1872. The Receiving Room, where guns are delivered, and the Proof Master’s House to the left of the building were both built in 1826. It is here that the London gun mark ‘GP,’ beneath a crown, is placed on guns suitable for firing and those, following deactivation, safe for collectors. For over three hundred years guns for private and military use have been inspected, proved and marked here. Wow! So great to see some of the places that I lived around and passed everyday going to school in the 60′s. Leman street especially has a place in my heart for fond childhood memories. I lived in West Tenter street in a prefab, great times. Thank you for publishing!! Wow. I didn’t know about the majority of the buildings here. Great post. I am pleased that the legacy of the slave trade in the extant built environment is not being ignored! Too often simply campaigns against slavery are acknowledged rather than the slave trade itself – this barbaric basis to much of the wealth of London needs to be remembered. You cannot beat a spot of 17th century architecture to my mind. All of these remarkable survivors share the element of proportion. I think we tend to overlook this quality these days – and the results are not conducive to a happy way of life. The 1930′s flats’ grace and modesty is pleasing to the soul. Well spotted, GA. I used to pass Gwynne house when I was at the London, without really noticing it. The photo jogged my memory. The German Hospital had an Art Deco wing, now flats. Very interesting. The Co-op building is 99 Leman Street. Famous tea was named after it. Love your choice of buildings and hope they never become just facades. 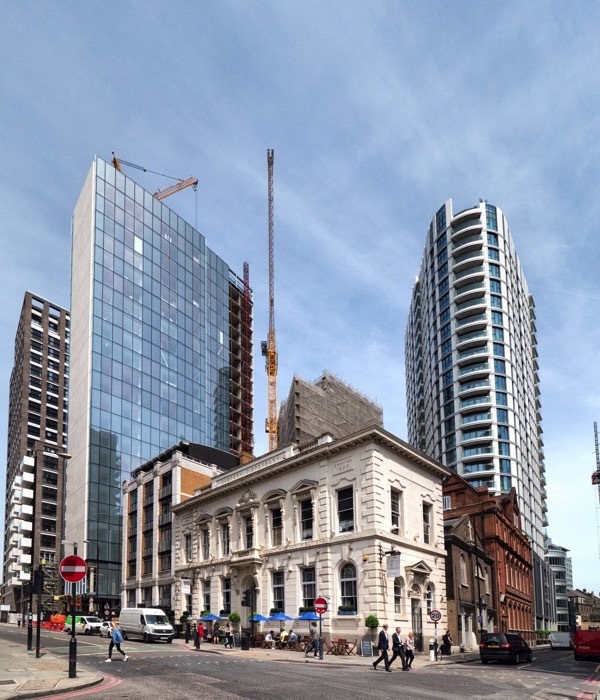 We enjoyed your talk on ghastly facadism at RIBA but left feeling quite depresesed! Good to hear there may be some hope of saving the Still and Star in Aldgate. Interesting to see the photograph of the Co-op’s London Headquarters. So often associated with the north, the Co-op is to celebrated for its political, social and economic role in ordinary people’s lives for 172 years. It has been part of my life since I was a child, when I remember sitting with my grandmother while she let me lick and stick the divi strips on a card, which she then took to Co-op headquarters, in the centre the of Bolton, where they were transfered into savings. When I thinkof Leman St, I can see the fictional detectives of ‘Ripper St’, currtently on its 4th series. As late Victorians, I can now imagine them passing the Co-operative’s London Headquarters as they step out to solve another grizzly crime. Every time I read an article on old buildings, architects, workers or educated families, and see how well built but without care, begin looking like and old molded sponge that hardened. The vines on some photographs these writers over the past year have featured in their write ups on property and building, family type, employment, section of England where the story of the property has been placed, makes an old woman of 70 weep. All of my old homes and towns are being demolished. One adobe historic home in Mesa, AZ USA has been vandalized. Two bedroom adobe brick was claimed part of a historic neighborhood. Little did we realize, that neighborhood changing, violence and families moving into apartments these old places do not stand a chance. How many Christmas trees were in the house from 1956-1962? How the two old grandparents danced a polka or western dance at the Mormon Center. Kids and their wooden cars built with an old lawn mower engine, moved down the streets. Across from the adobe brick home, was a 5 bedroom home with children galore and parents who watched the young ones as they played in the large front yard. All history is removed. We are modernizing for the new groups of families. 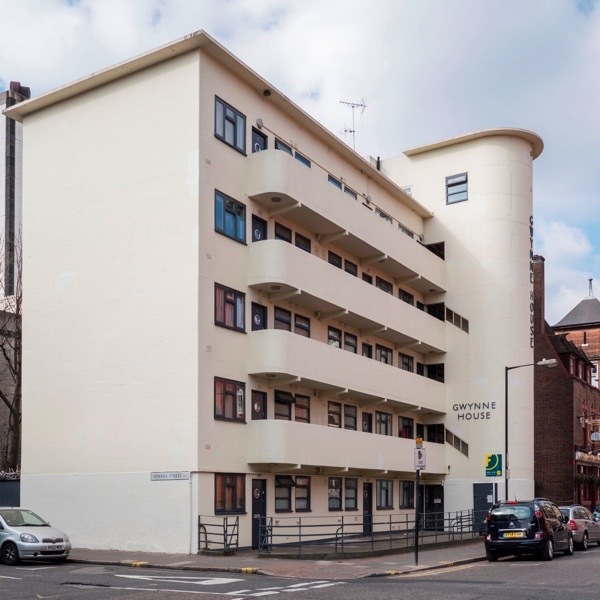 I lived in Gwynne House from 1947-64 and am pleased it is being regarded as a building of note. It is surprisingly similar to the Isokon Flats in Lawn Road, Hampstead. So pleased to see it is still in existence. Hazel Finn – I’ve been looking at where my grandparents lived after moving from Australia in around 1960, I’ve found that they lived in gwynne house and I’m wondering what it was like at that time?